The simple supplies you will need to wax your watercolor and gouache paintings. Step by step instructions that are very easy to understand and watch each step. How to apply the wax without lifting the watercolor layer. Find out how long you should wait before buffing and why this is important. How to properly buff the wax and how to LISTEN for the right sound. The video resolution is HD so you can watch this on your hd tv, or monitor with great clarity. THIS VIDEO IS DOWNLOADABLE. Watch it whenever you like, no expiration date. I’ve been wax varnishing my paintings for a couple of years now with fabulous results. It took loads of research and experimentation which I enjoyed (I’m a research hound / mad scientist type!) and am thrilled to now offer you a compilation of my discoveries and process along with a high resolution video with all the tricks and tips. 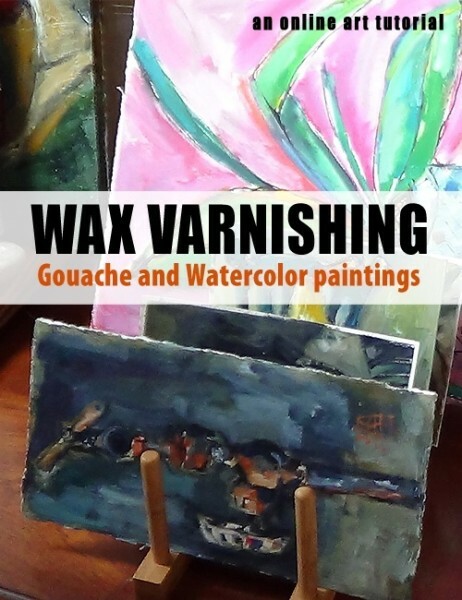 Gouache and watercolor paintings can be displayed safely without glass after being wax varnished. Leave the choice up to your collector. They are STUNNING waxed and are on par with oil paintings! Add the LOOK of encaustic to your watercolor and gouache paintings, without any of the toxicity of encaustics. No heat is used. After watching this thorough tutorial you will immediately be able to wax your paintings with confidence.